Often on Saturdays we find ourselves trying to catch up on house work and errands. Today we spent the morning and early afternoon focused on cleaning up the house. Bethany worked with the kids on getting toys put away while I helped get the kitchen cleaned up. We have what I’ll call a half-size dishwasher which means we just can’t do large loads. One large pot or pan in that thing and it feels full. This means if we even delay one load we’re backed up. I’m happy to report we’re back on track and things are nice and tidy. After the housework we decided to go out and just spend some time in our town. 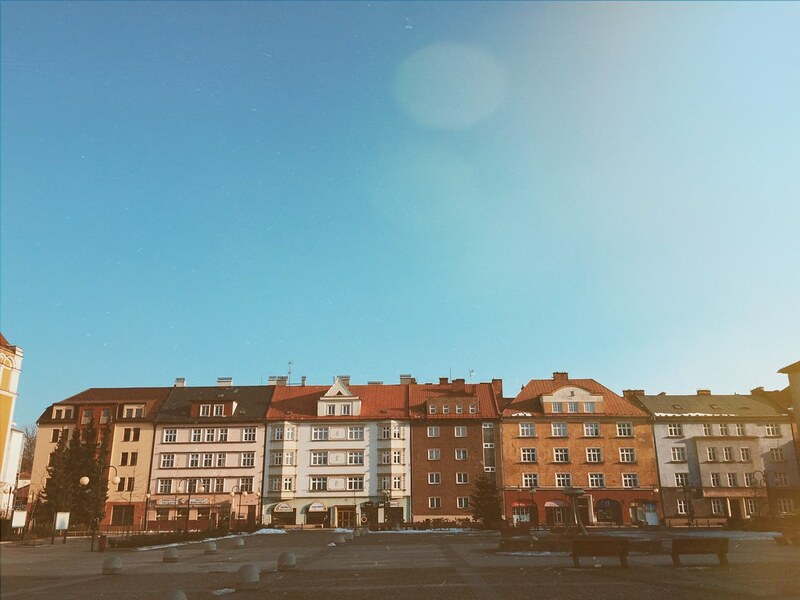 The weather was in the high forties and we had clear skies, so it was a nice day for a walk. 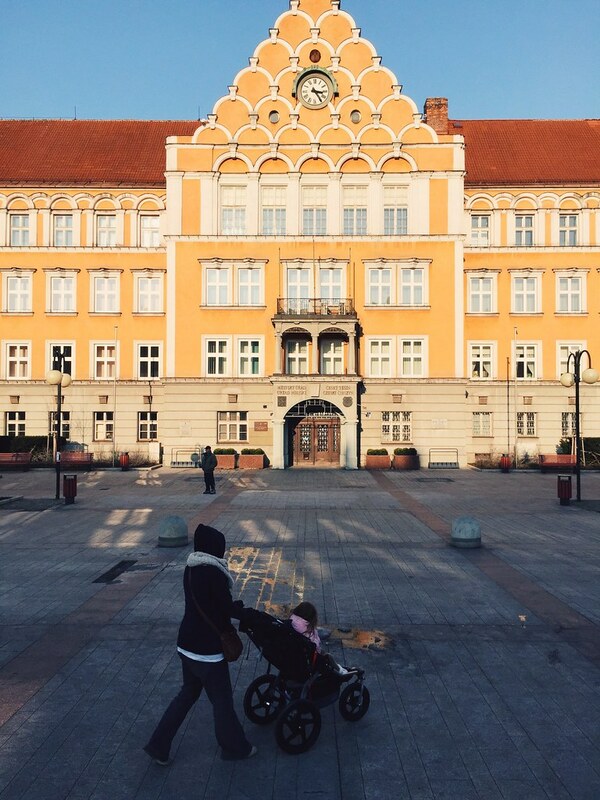 We headed to the town square where the kids like to run around the water fountain. They were sad that it’s not running right now, presumably because of winter, but we had fun chasing each other in circles around it. 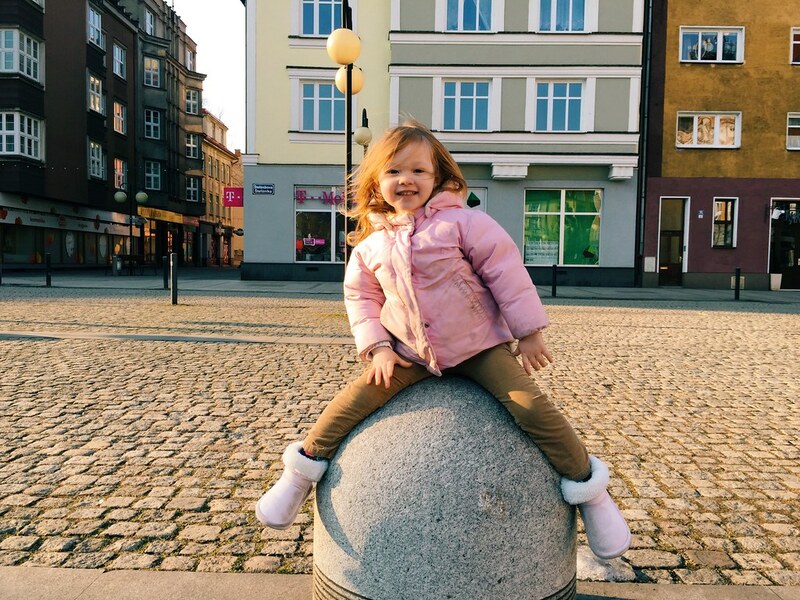 Below is a photo of Avery on the big concrete pillar things that line the square and beneath that is a shot of Bethany with Avery in our big stroller in front of the town hall. While we were out Bethany remembered our friends telling us about a little cafe that we had never been to. A lot of stores and shops are closed by noon on Saturday in our town, but we decided since we were just walking and having fund we would go see if they were open. Amazingly, they were, and we went inside. It was a fun little place and they even had a little play area for kids inside. 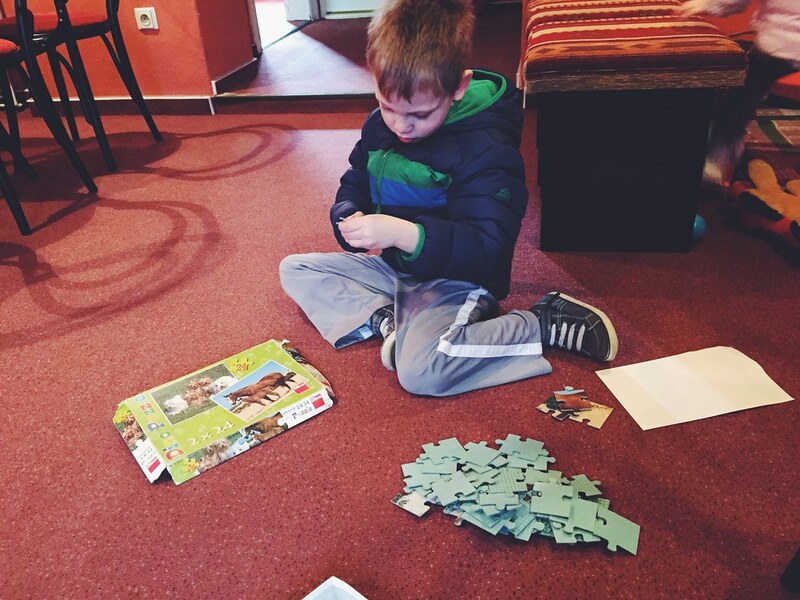 Below is a photo of Titus beginning work on a puzzle he found among the books and toys. We had fun trying to figure out how to order hot chocolate for the kids and coffee, for us but the woman running the cafe was very gracious with us. They didn’t really have hot chocolate in the traditional sense, but they had this kind of hot chocolate pudding stuff. I can’t really describe it, but it’s thick enough to eat with a spoon. It wasn’t expensive, and you could order lots of different flavors. We ordered chocolate/banana and chocolate/strawberry for the kids. Titus and Avery weren’t really into, but Bethany and I loved it! I’m so glad we got to enjoy that little shop and hopefully we can go back some time. 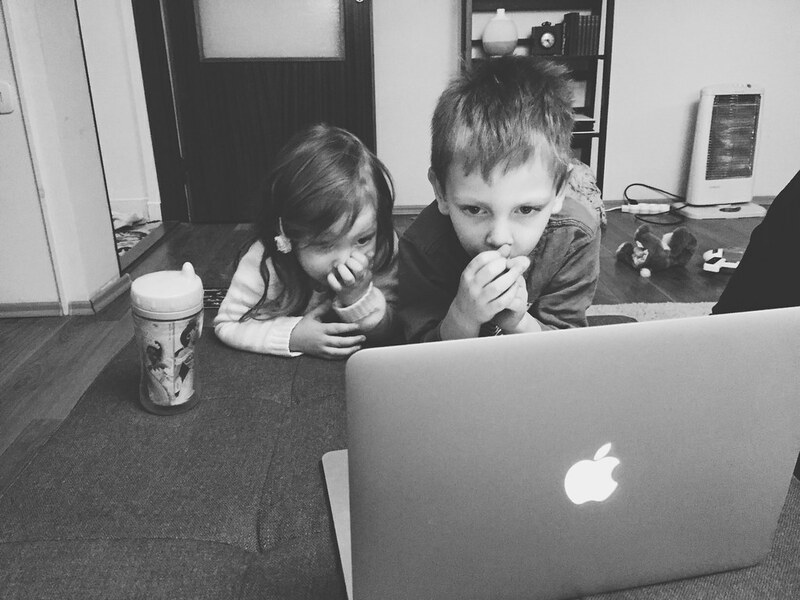 The kids enjoyed a little video chat time tonight with Nana and Papa (Bethany’s parents). Papa was kind enough to read them a book over the computer and the photo above is them just enthralled with the story and Papa’s storytelling abilities. Immediately after we finished with Papa and Nana we headed to youth group at our church. It was a special night where they were inviting friends and doing an extended music time. There were a lot of students there and we were a little late so there weren’t really and places for us to sit. It probably wasn’t the best night to bring the entire family, but the kids had fun listening to the music and they were a little sad when we left early. It was fun to be there and I like that the students are getting more familiar with us being around. All that to say…it was a great Saturday!